Does anyone know what day (June 12) it is today? It's National Peanut Butter Cookie Day! Yes, that's right, peanut butter cookies, the blue collar workhorse, of cookies has its own day and it's today. 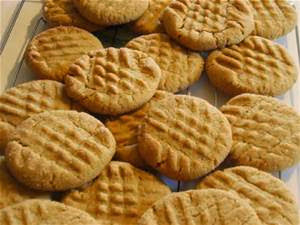 Peanut butter cookies will almost always have that distinct criss cross pattern made by a fork on top of each cookie. You ever wonder why that is? And no, it's not a Twitter hash tag. I'm pretty sure peanut butter cookies predates any form of social media for you folks born in the 21st century. The reason why you would make that pattern on a peanut butter cookie is because the dough for peanut butter cookies is quite dense such that it does not spread easily in the oven during the baking process unlike a chocolate chip cookie for example. To fix this, someone decided to press down on the cookies using a fork before baking in order to flatten the cookie and help it spread, and that was when history in baking was made.